Homer’s Odyssey is an epic journey that has become one of the touchstones of the literary canon. But at its heart is the journey of a father who wishes to reunite with his wife and son. Of course in true Homeric style the way home is scattered with obstacles that include monsters, unforgiving gods, descent into the underworld and ravenous suitors waiting to take his wife and kingdom – should he not return. To stage such a production with ease and fluidity Paper Cinema’s have worked their magic through carefully choreographing a live animation sequence. 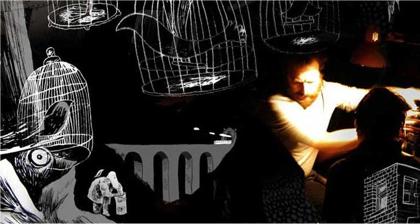 This Odyssey is not a mere re-telling but a re-imagining of Odysseus’ adventures and in doing so it brings the clever ink drawings of Nicholas Rawling to life through clever puppeteering and a brilliantly evocative live score. Utilizing the traditions from the very first pioneers of cinema (think spinning magic lanterns all the way to the silent film accompanied by an in-house pianist) alongside a variety of animation and sound effects (including instrumental and voice), the company navigates its audiences through a highly visual extravaganza, that is enriched not only by the inventive storytelling methods but also by the complete display of how the magic is manufactured. A simple projection screen with calico screens alongside it forms the backdrop. The five company members are Rawlings and Imogen Charleston, the main puppeteers, accompanied by three very talented musicians: Chris Reed, Hazel Mills and Katherine Mann (Quinta). Together their technique and style are entirely visible to the audience, shifting the conventional suspension of disbelief to an appreciation of mastery and skill. At times however, it does feel that the form overtakes the story and that the style rather than the narrative becomes the main attraction for the work. At approximately 70 minutes of running time it verges just a tad on the long side but nevertheless for the majority of that time is successful in its pacing and energy. For an example of sophisticated theatrical magic that merges form and genre in a highly imaginative manner, Paper Cinema’s Odyssey is undoubtedly a storytelling feast with plenty to offer to its audiences.